Choosing the right menu type to ensure great navigation on your data visualization is more important than you may realize. Just think about how heavily dependent you are on menus to navigate your favorite apps and websites. Most people use up to a hundred menus a day without even realizing it! 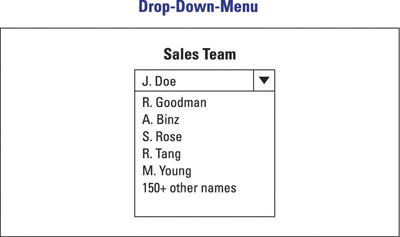 A menu selector is a component such as a drop-down menu or list box that enables the user to filter and/or navigate through different data views on a given data visualization. Drop-down menus: Drop-down menus are among the most popular menu selectors because they’re compact and can display a long list of items. At times, however, you shouldn’t use a drop-down menu, like when the list of menu options is too long (30 or more), as shown in the following figure. List boxes: Another very popular option is the list box. Used to display huge lists of data, list boxes are straightforward and work well with huge data sets, as shown in the figure below. 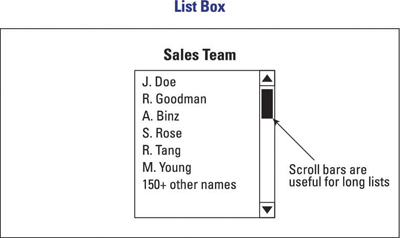 A list box with a scroll bar is useful for long lists. 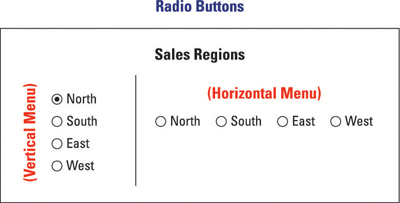 Radio buttons: Radio buttons are less popular but work well when you have a small set of selections, as shown in the following figure. If you have more than five options, you should avoid this menu type; the display could quickly exhibit data overload. Tab sets (vertical or horizontal): The highest-level menu selector is a tab set. Tab sets are best used when you need to differentiate sections in a collection of visuals. 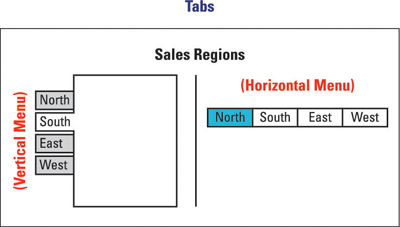 You could use separate tabs to show the visuals for four sales regions (North, South, East, and West) in the same data viz, as shown in the following figure. 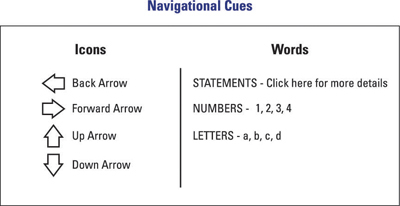 Another way to provide navigation is to use icons, such as arrows or text, to guide the user (see the figure below). These visual cues are easy to read and serve the same purpose as a street sign. They guide the user through the data viz.